"There are also some less well-known phones sitting around - for instance, another LG Windows Phone 7 handset (the GW910) was boxed all over the place, and that's a chassis two device (as in it comes with a physical keyboard) so we know that won't be available in the shops for a while." 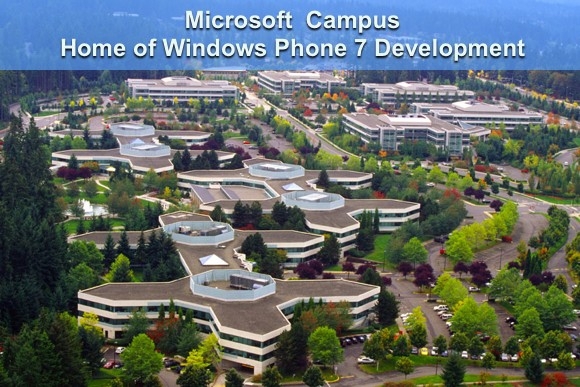 TechRadar was recently invited to spend some time poking around the Windows Phone 7 development lab on the Microsoft campus and reported about their experience. It seems there was much of what you would expect to find in such a lab. There was a mixture of real (i.e. human) and virtual testers, giving both the hardware and software aspects of the platform and test devices a thorough workout. Their report does unearth a few interesting tidbits, including the fact that Microsoft is claiming this is their most tested operating system ever. They also saw a couple of as yet unannounced and unreleased (at least officially) handsets from Toshiba and Acer. It appears from this look behind the scenes that Microsoft is dead serious about the Windows Phone 7 platform and is focused on ensuring a good user experience. Those aren't actually the buildings where we work.